Benefits: Even on a LCHF food plan having a hamburger or hot dog bun would be a treat, right? How about a warm fresh roll with butter from pastured cows? This recipe is a great one to try! I like this option for two reasons; it is LCHF for those who are trying to be fat adapted for fuel. This recipe is also a great option for people with celiac who want a LCHF version of a gluten free bread. So many gluten free bread options are really high in highly processed starches. NOTE: This recipe uses psyllium husk powder. I usually buy this fiber from Thrive Market, an online health food store: www.thrivemarket.com. I like the Organic India brand that actually comes as whole husk psyllium. In this recipe it won’t work as whole husk psyllium. Trust me, I tried it. If you use whole husk psyllium you need to grind it in your blender. My NutriBullet works great. Measure the 5 tablespoons of ground psyllium husk AFTER you grind it so you have the correct amount for the recipe. You can also buy pre-ground psyllium if you look for it. Mix the first four dry ingredients in a medium size mixing bowl. Add the boiling water, vinegar and egg whites to the bowl with the dry ingredients, while beating with a hand mixer for about 30 seconds. Do not over mix the dough. The consistency should resemble Play-Doh. Turn dough out onto a cutting board and form into a log. Use a knife to cut the dough into 6-8 equal size pieces. If the dough is sticky and hard to handle try moistening your hands. Carefully shape the dough pieces into dinner rolls or hot dog or hamburger buns. The buns will increase in size during baking. Try to avoid over working the dough. Place on a baking sheet lined with parchment paper. Bake on lower rack in oven for 50–60 minutes, depending on the size of your buns. They are done when you hear a hollow sound when tapping the bottom of the bun. Cool on a wire rack completely and carefully slice with a serrated bread knife for buns. If you make dinner rolls serve with butter and toppings of your choice. 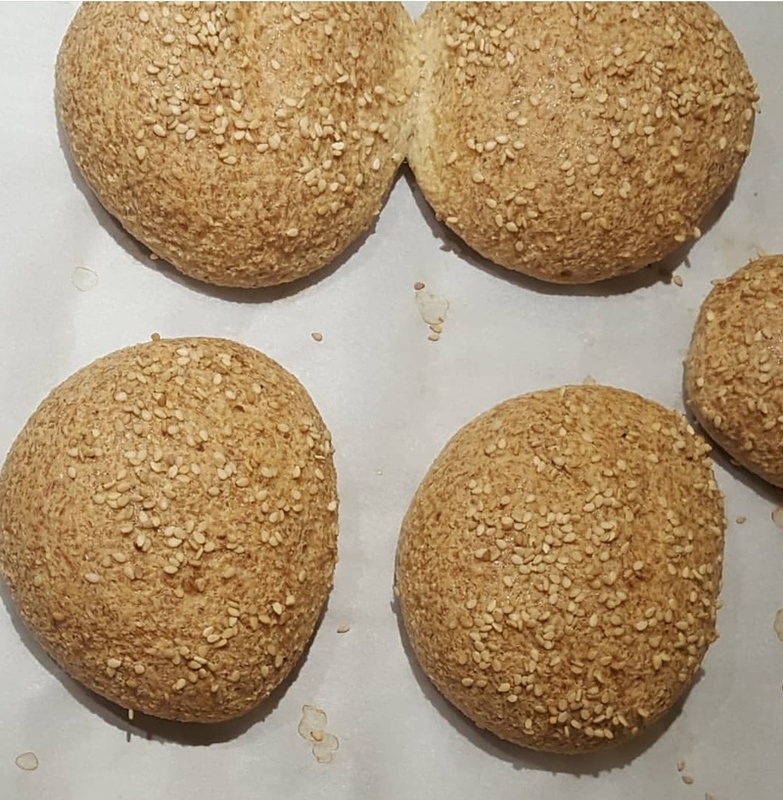 Store any leftover buns/dinner rolls in the freezer. When ready to use thaw for 30 minutes. Option: Carefully toast using a toaster on low setting or by slicing in half, buttering the cut side and heating until lightly brown in a ceramic non-stick pan. One-sixth of recipe provides 196 kcals, 11 g protein (24.2%), 3 g net carbs (6.6%), 14 g fat (69.2%) and 12 g of fiber.